What do previous guests say about La Ville au Tady? We have been renting our cottage to guests since 2006, and have received many positive comments, and we share some of those with you here. We have had over 200 guests stay at La Ville au Tady, and we have a very high satisfaction rating with several guests returning year after year. We aim to provide you with all the information you need to make an informed decision on whether La Ville au Tady will be right for your holiday needs. Please check out our on-line Flickr photo album which contains hundreds of photos of the cottage covering every room and the garden. We want all guests to have a great holiday at La Ville au Tady. Holidays are important... too important to take a risk. That's why we try to let you know exactly what sort of place to expect so you can make an informed decision if La Ville au Tady is right for you. 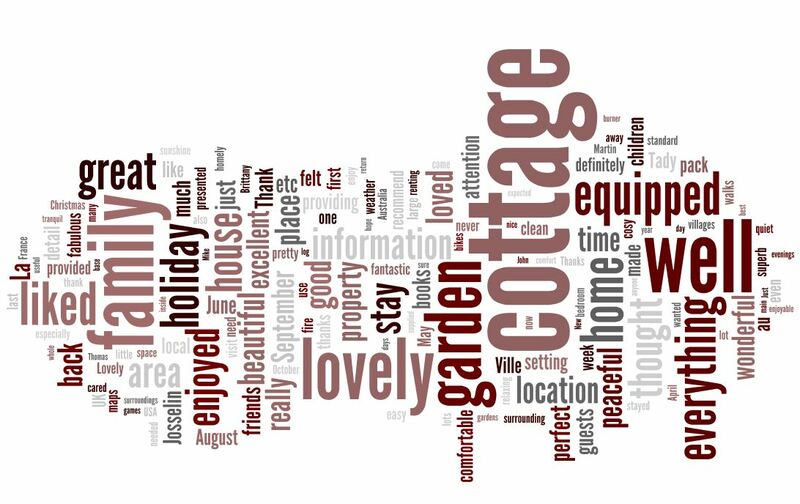 If you decide our cottage is right for you, you will be reassured to read the many positive comments we have received from previous guests, or you can access our independently submitted and verified TripAdvisor reviews using the TA logo (left). Many thanks for letting us share your delightful gite, we have enjoyed the most wonderful holiday, no doubt improved further by exceptional weather, no rain to speak of and a great deal of sunshine. The cottage was spacious and well equipped and so quiet and peaceful without being to isolated, a most welcome break. Your suggestions and details for places to visit were most helpful and gave us afternoons out, Rochefort-en- Terre was certainly our favourite. Over many years of holidaying all over France together we all agreed that La Ville au Tady is the one of the nicest and best situated properties we have stayed in. ​John & friends. September 2018. Gloucestershire, UK. We arrived home on Saturday evening thoroughly happy and relaxed after our wonderful holiday at La Ville au Tady. As stated in the visitor book we have been visiting France for over twenty years staying in all manner of Gites, houses etc. La Ville au Tady is the best yet. The house has so much character as to make it a magical place to holiday. The equipment level is unbelievable and you have provided for every eventuality, even to washing my car! ​Thank you also for your professional service from booking/website/Follow up. To top it all there was the glorious weather that we had and of course FRANCE! We have had value for money and a stress free holiday what more can we say but many, many thanks. ​Bob, Jane and Daisy. August 2018. Lincolnshire, UK. Without exception this cottage is not only one of the best equipped we've ever rented, but the owners provided every extra you could want - and usually have to buy. Just add people, food and wine and you've got a perfect holiday. Southern Brittany has some stunning venues to visit, and after that the enormous garden is the perfect place to relax, watch wildlife, or just wander through the trees and vegetation. When the sun goes down if you need a little warmth the large wood burner in the lounge provides the heat, and a warming glow in which to stare and contemplate the meaning of Life, the Universe and Everything (the answer is 42 for Douglas Adams fans). Martin and Esther have thought of everything in providing a cottage equipped with all you could wish for - whether you want an active time (bicycles in the shed), or somewhere to put your feet up and enjoy the sun in a beautiful garden with lots of wildlife. We had a perfect holiday and thank them gratefully for their generosity and hospitality. ​Roy and family. September 2017. UK. Worth every minute of the drive from the ferry (Roscoff, but Saint Malo is probably nearer). Very clean, every home comfort considered and provided for. Lots of space for everyone. Wonderful gardens - we sat in them every day, ate lunch, dinner and even one breakfast outside, and admired the many butterflies, bees and lizards who were busying around. The cottage is well placed to reach west coast beaches and some of Brittany's 'Petit Cites de Caractere' and we particularly enjoyed visits to Josselin (spectacular chateau on the banks of the canal, great restaurants, live music, walks and cycling) and the flowers, ice creams, gourmet food shops and picnicking in the chateau grounds at Rochefort en Terre (which closely resembles the village from Disney's Beauty and the Beast). Other local attractions included an open air swimming pool 10 minutes away, which was a highlight for our children. We had a great week, and we hope to return again. Next time we will hopefully do more walking and cycling (on the bikes our hosts kindly made available) as there are lots of possibilities. ​Jenifer. August 2017. Bath, UK. Just to say what a fantastic house you have in France. My wife and I loved every minute of our 6 days , even if weather wasn't always sun and clear blue skies. We visited Damgan, Lizio, Carnac, Rochefort, Josselin, Ploermel etc and made the most of it. House, gardens, bbq, and outside seating areas were excellent, and we wanted for nothing. It was nice to take time out from work and chill in the evening sun each day. We will be back. Kevin and Marie. July 2016. UK. We returned for the second time to this lovely cottage which is so well equipped and situated in a wonderful rural location. We all love the countryside here and the autumn colours have been wonderful this year. Everyone we meet are friendly and keen to talk. ​For all of us it has been a privilege to stop, rest and reflect, and in the evenings enjoy the tranquility and peace of La Ville au Tady, sitting reading by the fire. A time to value things that are important in this wonderful retreat. Tim, Lorraine, Robin and Trish. October 2015. Cornwall, UK. Thank you Martin & Esther for letting us stay in your lovely and superbly equipped cottage, you have thought of absolutely everything one would need for a comfortable holiday. All in all a fantastic week. We will certainly be recommending La Ville au Tady and we're sure others will find it as easy to deal with you as we have. Mary & Tony. October 2015. Perth, Australia. We have had a very enjoyable week staying in this lovely cottage. So well equipped - the best we've ever come across. The weather has been exceptional for the time of year. Hot sunny days with cool evenings and mornings. We were very cosy with the log fire or radiators on. We often spent an hour late afternoon basking in the sun trap in the front garden. Thank you Martin & Esther for taking such care to make this cottage such a perfect holiday home for so many different groups of people. Rita & Peter. Sep/Oct 2015. Hertfordshire, UK. Wow! What a find. This is truly an excellent property in a wonderfully peaceful part of Brittany. The cottage was superbly supplied thanks to the enormous thought invested by the owners Martin and Esther; we wanted for absolutely nothing throughout our stay; in fact we have never rented such a well equipped and provisioned property. The booking process was so efficient, Martin is a speedy and very helpful communicator and their website is so informative. Also I must make a special mention of the enormous effort invested in putting together the visitor information book at the property - what a great job you did the book is fantastic. We were a party of 6 adults for which the house provided more than adequate space and it was really cosy and comfortable. The gardens were just wonderful, we really enjoyed watching the birds and wildlife in general. The provision of bikes to explore the local area we thought was a real bonus and we also enjoyed walking the lanes and country roads of the area. Supermarkets are close by (just off the N24 at Josselin) and the Village of Guegon was great for the morning bread and croissants. From the property we managed to visit all the usual sights of Brittany, Josselin, Vannes, Auray, Guerande, Malstroit, Rochefort en Terre, Concarneau, Quimper, Locranan, Quiberon Peninsular and its Cote Savage, Pontivy, we took a boat trip on the Blavet River, Carnac with its Alignments (standing stones) and La Trinity sur Mer. What a fabulous holiday, thanks a million Martin and Esther, we cannot recommend your lovely house highly enough. Janine & friends. September 2015. Caerphilly, UK. With a sad heart it is time to say goodbye again from our 5th visit to La Ville au Tady. As always very clean and tidy - it is always a pleasure to stay here as it has everything we need. Thanks again for some more great memories. Hope to come again. The Walford family. August 2015. Forest of Dean, UK. Our recent holiday at La Ville au Tady was quite magical. So well equipped and home from home. You have put a lot of thought into how your visitors will feel when they arrive. We travelled out every day to most of the regions best attractions. So convenient from the cottage. Our favourite was Rochefort en Terre and the 'Lion' restaurant but the Bay of Morbihan, Carnac, Vannes, Lizio etc were all memorable. It was relaxing to come back to the cottage every afternoon, have a Kir Breton and revisit our adventures on our iPad photos. The WiFi was really appreciated and worked very well. We were able to keep up to date with loved ones and the 'rest of the world'. Will hopefully encourage our extended family and friends to come and explore the region from La Ville au Tady in the future. Valerie, Marylynn & family. June 2015. Australia & UK. We had a great 2 week stay at your lovely cottage near Guegon. We have written a full page about our holiday in your visitor book detailing our trips around the area and our lovely experience in La Ville au Tady - inside as well as a lot of garden time. Thank you for the opportunity to enjoy such a lovely place and for all the thought and care you obviously give to ensure your guests have an easy and relaxing holiday. Beryl & Martin and friends. May 2015. Harrogate, UK. We had a really great time in Esther's and Martin's cosy house: the house is super well equipped and we found a lot of extremely useful information provided on tours, shopping, staff to do with kids - just to name a few .....the kids loved the huge garden with its rich vegetation, we loved the fireplace in the evenings, the great kitchen.... Perfect situation - lots of stuff to do also on rainy days. Would come back any time!!! Jens & family. May 2015. France. My daughter and I were visiting Brittany to explore and look at properties for a 2nd home. I have a passion for Longeres and wanted to experience living in one to determine if it suited my life. I was very lucky to discover The Selway’s beautiful home. It was comfortable and very special. We had been warned by many well-traveled friends that Brittany has a tendency to be a bit raining. Our visit proved them correct, however our days were filled with showers and rainbows. We were only minutes from Josselin, but loved the house so much, that we rarely went out except for walks and shopping for food. We cooked most of our meals in the wonderful kitchen and would have a wood burning fireplace going and Breton Music playing on the sound system. The Selway's have managed to offer anything and everything a traveler could ask for and we felt as if their beautiful home in the country was ours. A definite recommendation for anyone who wants to feel as though they have always lived in France or want to experience the opportunity to live in the country while being only minutes from a beautiful town. Edward Weiant. May 2015. USA. There is always the excitement and anticipation when travelling to a new destination and our stay at La Ville au Tady has been memorable. The house is very well equipped and the kitchen the best we have ever used. We were blessed with exceptional weather and enjoyed the garden and wildlife. The area around has so much to offer and the books and leaflets point out more places to visit. As we prepare to leave there is a little tinge of sadness having enjoyed such a great week and so we have booked again! We leave with memories of stunning countryside, vast sky's, lunchtime meals and log fires, and most of all laughter! Here we have known the joy of resting and relaxing. Tim & Lorraine Rogers, Robin & Trish Knights. October/November 2014. Cornwall, UK. We have had a wonderful time here. Even for 6 persons it was enough room. Some nights were quite cold (5 degrees C.) so we lit the fire and it became very cosy in the gite. We were lucky with the weather since we only had two days rain and mostly it was sunny, up to 20 degrees. We take a lot of memories with us. Thanks to the owners for their lovely gite. Hans, Johanna, Jan & family. October 214. Berlin, Germany. We had a really good week here at La Ville au Tady. The house has a really homely feeling to it and is very tranquil. Friends came to visit us for a couple of nights and there was plenty of room for us all. We didn't eat out but prepared some lovely food here. Overall, very relaxing. Many thanks to Martin & Esther and their caretakers who made sure the place was nice and clean ready for our arrival. Mark & Sue Tunley and friends. October 2014. Poole, UK and Brittany. Wonderful place in a beautiful area. Accommodation more than described. Especially loved relaxing in the garden. Thank you for making us feel like we've just walked into someone's home who's just popped out (as my husband put it). Eleanor, Richard & Ian. September 2014. Bournemouth, UK. Wow! La Ville au Tady certainly lived up to all our expectations. Everything we needed in a beautiful longere. A good centre to explore this area, especially Rochefort en Terre, Vannes, Lac au Duc and many more. We were very lucky to have the fire, warm weather, and were able to have our afternoon tea and wonderful patisseries in the garden with the company of a beautiful friendly ginger cat. We had a fantastic holiday that we will all remember for a long time. Jane & Chris Edwards, Kay & John Haines. September 2014. Winchester, UK. This is our fourth visit to this house and it is still a firm favourite. As always, very clean, well stocked and nicely kept. Our kids love coming here, they call it their French holiday house. My youngest was a baby on our first visit and is now four! The garden is a great hit, the kids love playing in it and we love eating and drinking in it. We have already booked for next year and cannot wait to return for my Breton cider in the garden. Sarah & Nathan, Sam (5yrs), Esme (4yrs), Elwyn & Margaret (Grandparents) Walford. The weather was superb all week, an absolute scorcher! We visited Josselin and enjoyed the château and walks as well as Lizio where the Ecomuseum was brilliant. Market day at Vannes was excellent, good prices and friendly people. The shops are amazing and architecture fantastic. Most of our time spent relaxing and watching the lizard family run around. We had a fabulous holiday, La Ville au Tady came up to all expectations and more as we return home tomorrow feeling refreshed and happy. Sandra & Bob. August 2014. Nottingham, UK. Fantastic! It’s been a wonderful week, and such a shame to have to come home & work, but needs must. We have commented in your visitor’s book, but I also wanted to send this brief email. I really have to say I was so very impressed by the cottage. I have never seen a rental so very well equipped. I think you thought of everything. We never wanted for anything. It’s a credit to you. We were blessed with some wonderful weather. Our friends who travelled with us have never experienced such tranquillity and practicality. All in all the week has been a present to us all. Dear Martin, we had just a tremendous week with the weather being kind and it rained just when we travelled. We drove 1450 miles this week so hardly an inch has been missed! Thank you so much for all your kindness and help and for the good taste in choosing such a perfect cottage. We hope to come again very soon. Best wishes from the Smith family, David. David Smith, May 2014. Wales, UK. Just thought we would like to e-mail to say what a brilliant time we have had at your cottage. The weather was very kind to us and we had some very long lunches in the garden. We would also like to thank you for the use of your laptop and all the little extras are a really lovely and much appreciated touch. Julie Kerr, May 2014. UK. We have stayed at La Ville au Tady three times and have always enjoyed our holidays. The property is beautiful, homely and fantastically equipped. The owners are very pleasant to deal with. The setting of the property is a particular benefit. The garden is very attractive and tranquil and the location of the property is quiet and peaceful whilst being in easy reach of many beautiful and interesting parts of Brittany. Nearby Josselin, is very historic with good restaurants, an imposing chateau, good supermarket and bakeries and a busy market on Saturdays. The best self-catering property I have ever stayed at. Nathan Walford & family. April 2013. Gloucestershire, UK. The cottage was excellent - absolutely fab. We couldn't fault it. Everything was there for us. We loved the fact that we didn't have to buy washing up liquid etc. which costs a lot and you never use it all. Loved that we had plenty of outdoor chairs as well. We had a fantastic holiday. Lovely and peaceful. Would love to go back there again. Alison Pooler. Staffordshire, UK. August 2013. We would rate the cottage as excellent. It was exactly as the website described, we found the cottage clean and equipped to a very good standard. The cottage had a real 'homely' feel, it was peaceful and relaxing. I liked all the different seating areas in the garden. The visitor’s information folder was excellent, the information was clear and concise and we used lots of the suggestions for local places to visit. Carole Young and family. August 2013. Portsmouth, UK. We had a lovely week at this gite. The Breton character of the gite has been well preserved. We liked the location and the countryside around La Ville au Tady. We especially liked watching the lizards sunbath on the old Breton clogs outside the kitchen window and around the outside of the gite. They were fascinating to watch when the weather was sunny. La Ville au Tady is such a peaceful small hamlet. The countryside around it is beautiful. We heard a cuckoo twice when out in the garden. I never hear this bird in Devon. Peter & Cynthia Boskett. May 2013. Devon, UK. We enjoyed our stay in your cottage, even in November! The weather was better than could be reasonably expected, which helped. However both the area and the comprehensive facilities you have provided made for a very enjoyable stay. We did not use the central heating, apart from the bathroom, until the final night as the stove provided all the warmth required and the cottage retained its warmth in an amazing way. We would both like to return at a more clement time of year, next spring perhaps. David & Gina. November 2012. Cheshire,UK. We are departing your farm house this morning, everything was wonderful. The computer worked perfectly for updating my GPS and it came in handy to get us around, thank you again for your help. The cottage was wonderful and the fires at night were perfect. Joshua & Andrea. January 2013. Wyoming, USA. This is a return visit for us, and the cottage was once again excellent. We love the space, quiet, comfort, garden, lizards, bees, birds and butterflies. Thank you again. We hope to be back next year. Dr Susan Turner. September 2012. North Berwick, UK. We loved the cottage; it was well equipped, obviously well-loved and clean in a lovely quiet location. We The things we liked were - that the cottage had a homely feel, all the outside sitting and dining areas, the use of the bikes, the garden, the location, the useful tourist information maps and books. Thank you for letting us stay and we'd like to go back again sometime. Gaynor Riley. July 2012. North Yorkshire, UK. Thank you so much for all your generosity. Your home was perfect. We had such a fine stay here. We all hate to leave and wish we had booked more time. The kids had so much fun playing in the huge yard. My husband wants another week just to hang out in the garden and read and sit in the kitchen in the early morning sipping his tea. Also thank you for the use of your laptop - it has made blogging and emailing so much easier than our iPhone. Thanks for the best stay! Terry Busse & family. June 2012. California,USA. A beautiful location for our week long stay. The house was as described and as seen in the pictures - very clean. The location was great for our trips to St. Malo, Mount St. Michel and Quiberon. The weather unfortunately was not too cooperative with rain and cool temperatures most of the week. We enjoyed using the bikes and the "third wheel" was great! The kitchen was well equipped and the living and dining room the perfect size for 4 adults and 2 kids. Lea Anne Sexton. June 2012. BC, Canada. As Mary, Wendy and John and I prepare to leave lovely La Ville au Tady in the morning, just a short note to say a big Thank You! for everything... and to let you know how much we have appreciated our time here these few very short days. After much rain and cold in the days leading up to our time here (we had been in Brugge then Honfleur and Bayeux) with all kinds of cool showery weather, the sun has come out to greet our time here and we have loved every minute of it. One day to Rochefort-en-terre, mostly just walking here, cycling with your beautiful bikes... and enjoying meals in the sunshine outdoors here in the garden. Simply beautiful! The accommodation exceeded our best hopes. Thank you for your kind hospitality. Ernie Harder. June 2012. Vancouver, B.C., Canada. This is a return visit for our family. The cottage is excellent - exactly as described and exactly as remembered from our visit in 2010. Every need catered for, lots of space, and a beautiful garden. Louise Leatherbarrow. June 2012. Bromsgrove, UK. Everything turned out great and we loved the house and all the extras you have for your guests, it felt just like home! We had a great time and found our way around with no problem. Have handed your card out to a lot of people. Thanks for everything and will return. Maureen & Tom. May 2012. British Columbia, Canada. Cosy, yet plenty of space. Comfortable. Very well taken care of -- inside and out. Spotless. Very well equipped. We can't thank you enough for setting it up so nicely. We loved our stay there and would go back in an instant. Thanks to the warmness and comfort of the house and yard and to your absolutely superb website (the suggestions of which we followed religiously), we couldn't have had a more enjoyable week. It was a week we'll remember forever. Ned Brooks. May 2012. North Carolina, USA. We thank you very much for offering this place to your guests. It is truly a lovely house and all your suggestions have been spot on. We hope to return, perhaps at a somewhat later time of year, so that the odds of being able to take advantage of the outdoor aspects will be increased. Dr Stewart Kiritz. April 2012. California, USA. We have enjoyed our visit in your beautiful and cosy cottage in Brittany. The visitor handbook is very complete and we used it very well. The cottage is very well equipped. We used 2 mountain bikes to cycle twice along the Nantes Brest Canal. Thanks and many greetings! Ronald Karssen and Marieke Louwerse. November 2011. Middleburg, Netherlands. We are back in the USA and wanted to let you know what a great time we had at your vacation home. We loved the cottage, the grounds, the kitchen, the Josselin Saturday market, walking around the area, day trips in the area, everything about our time there. Thank you so much for making it all so easy. Your cottage is lovely. I’ll try and figure out how to write a rave review on VRBO as we really had a super time there. Thanks for everything. Judy and Skip McGinty. October 2011. Washington, USA. Just to say thank you for letting us hire your longère in Brittany.We had a fantastic time, not least because the weather was amazing but also it was very comfortable, welcoming and well considered for guests.Thank you once again, and we will definitely be recommending to others. Heather & Graham. September 2011, Andover, UK. We thought the cottage was absolutely wonderful. It was superbly presented, very large and had everything you could require. We loved the large lounge where the focus was for conversation and not watching TV. Too many houses are set up just for TV. We loved the huge master bedroom and window seat. Our daughter loved the ‘magic garden’ at the back and explored even in the rain. Wonderful. All the books were fantastic. My husband didn't manage to finish the Breton Peasant book though. We are already recommending your cottage to friends. Thank you. We will be back! Ruth Depsey & family. June 2011, Manchester, UK. We stayed in this lovely house for a week. The location was quiet but with the village and the town nearby there was everything that we needed. The weather wasn't fabulous, but we were cosy and warm inside. The house well maintained and all equipment was in good condition. The detailed description that the owners provided meant that we knew exactly what to expect. We explored the lovely villages that were nearby and went further afield to the prehistoric sites on the coast. A great stay and we would strongly recommend this characterful home. Dale Sommerlad. October 2010, Sydney, Australia. Ann & Gordon Hutchins. June 2010, Shropshire, UK. I returned yesterday evening after a very successful and enjoyable short stay with my friend at La Ville au Tady. I thought I would write straight away to thank you for providing us with such a relaxing and welcoming house. We have been going to France and renting cottages/houses for the last 15 years, always in the Autumn, and we both felt that this year was one of the best experiences we have had. Your information pack and details gave one complete confidence that all would be in order and so it proved. The house was looking really lovely, in its pretty surroundings, in brilliant sunshine under a cloudless blue sky, for the first 3 days of our visit. The blue shutters, pink roses, and Autumnal hydrangeas were delightful. We found everything we needed and everything worked beautifully. The wood burner was a great pleasure to use, as the evenings were quite chilly. We left the log basket re-filled for the incoming guests. We were so grateful to find a supply of good dry logs, easily transported to the house in the wheelbarrow. We had stayed last year a few miles to the north of Josselin, at La Trinite Porhoet, but knew there were still several places we wanted to visit. So this time we went to Locmariaquer and, as the day was very warm and sunny, enjoyed a 2 hour boat trip around the Golfe. We also went to Malestroit, Pontivy, La Roche Bernard, as well, of course, as back into Josselin. It was a pleasure to return each late afternoon to such peaceful surroundings and to know that the nights were quiet. We are sure that any guests renting your longère will appreciate it as we did. Susan Baxendale. September 2010. UK. We have had a lovely stay at La Ville au Tady. The longhouse was terrific, more than we expected and the surrounding countryside just wonderful. The weather was just perfect. Oh, and we have never stayed anywhere that had a set of Le Creuset in the kitchen !! My dishes seemed to taste even better. Khairan & Bill. May 2010. Sydney, Australia. The cottage is an excellent property in a lovely situation with a super garden. It was such a bonus to have washing powder, toilet rolls, candles etc provided. There were lots of areas to sit and read in the garden or just bird watch. It was lovely having a wood burner for the cooler evenings. The seats at the front of the garden were lovely, and such a sun trap and so peaceful. We has a delightful holiday and will certainly tell all our friends and family about the cottage. We hope to come back again in the future. Val & Paul Grace. Plymouth, April 2010. We thought the cottage was very good, especially good value for money! We've never seen a self catering property so well stocked. The cottage was bright and clean inside and out, the wood burner was fantastic on the cooler evenings. Outdoors the gardens are great and we saw lizards for the first time ever. Our first visit to France was super, mostly because of the quality of your property. The weather wasn't great so having a fantastic place to stay made all the difference. It is obviously a well loved and cared for family home and that feeling made us feel relaxed. Thank you to the owners and cleaner and caretaker for all the hard work that has gone into providing such a lovely holiday home. Dawn & Phil Weston. May 2010. Todcaster. We love your longère! So charming and tranquil. Your attention to detail is remarkable. You have thought of everything, making it so easy to enjoy your longère, and to be quickly oriented and acclimated. I thought I was the organized, detailed one, but you two definitely win the prize.After chilling out in the garden yesterday morning, we toured Josselin and had wonderful crepes at Le Creperie du Centre. Yannic is a real nice fellow. Today's travels will take us to the market in Pontivy, and then on to Carnac and Auray before heading home to enjoy some wine in the garden. Thank you for sharing your special place. Pat & Eloise. Texas, USA. May 2010. I am so sad to leave this darling little house. I have been impressed over and over with how well the house is appointed. You've done a fabulous job of providing almost everything one could want---and more. You've anticipated every need and question. I am sure I'll never find a house as perfect as this one to rent in France. I also have been delighted by your design sense. As a former interior designer and now, artist and painter, I pay attention to paint colour and wallpaper choice and textures of rug, upholstery, and furnishings. I love how understated yet authentic your decor is... and how cosy and cheerful the whole place is. So, thank you again, for sharing this beautiful little jewel with me. I have been so happy here. I will never forget it. Laura Frankstone. North Carolina, USA. Sept/Oct 2009. The cottage was beautiful; a very quiet location; lovely garden well equipped for children’s enjoyment. The cottage was very clean, well presented and well furnished. Thoughtfully equipped with the whole family considered. A lovely atmosphere, a happy home obviously well loved. We would DEFINITELY!! recommend it. Mike Eugster & family. Hampshire, UK. May 2009.
in the area. Truly there was nothing that we needed. Our children particularly loved the lizards - which I realise nature had provided, not you - and the way you had cut the tracks in your back garden. Once again, thanks - we know which property to check availability on first when we next want to visit Brittany! Melanie & David Thomas and family. Salisbury, UK. August 2009. Having regretfully returned home last night, I wanted to send you an email to say thanks for providing such a wonderful holiday home / experience. From receipt of the pack which seemed to leave no stone unturned, when we turned up last Saturday afternoon, we were amazed at the quality of the cottage and gardens. You really had thought of everything when it came to making our stay as comfortable as possible. We were lucky to have great weather with which to enjoy the area, but what made it even better was the pack you left in the property which had ideas for days out. Without that we wouldn't have enjoyed a peaceful walk though Lizio, or found the Lac au Duc which our kids enjoyed tremendously.Our only regret was that we didn't stay longer, but we promised ourselves that should we return to that area that we would stay for 2 weeks – hoping that your cottage remains available. Many thanks for your touches and consequently our holiday. We will certainly be recommending this cottage to our friends and family. Steve & Hayley Conway, family & friends. Nottinghamshire, UK. June 2009. Your place is lovely - we couldn't want for more and we will get a real feel for living here in France as your place is probably what we would like ourselves. Thanks again for thinking of everything that makes it home from home. Janet & Tony Helliwell. West Yorkshire, UK. March 2009. © 2016 La Ville au Tady. All Rights Reserved.